Having stayed one night anchored in Prince Rupert Bay in Dominica the anchor was raised to head south once again, this time for Martinique. At least we tried to raise the anchor - the windlass struggled and it came up very very slowly. The problem was that the anchor had hooked into a bed of dead coral and a huge lump had come up with it. The lump looked like it ought to just slide off the anchor, but it wouldn't budge and we were just deciding how we might get rid of it when a local fisherman in a small boat came past and came to our assistance. A few blows from a hefty stone that he happened to be carrying broke the coral in several bits and it did then slide off the anchor. So we were free to head for Fort de France, the capital of Martinique. The passage down the leeward coast of Dominica was mixed, with strong winds funneled down from the hills one minute and no wind at all the next, In contrast, the open sea passage from Dominica to Martinique was much more consistent at around 20kts on or around the beam and we made 7 to 8 kts most of the way, with 2 reefs in the main and the genoa rolled a according to the wind strength. A squall raised the wind to 28kts and the genoa was rolled away and we maintained 6 to 7 knot under the double reefed main until in the lee of Martinique. 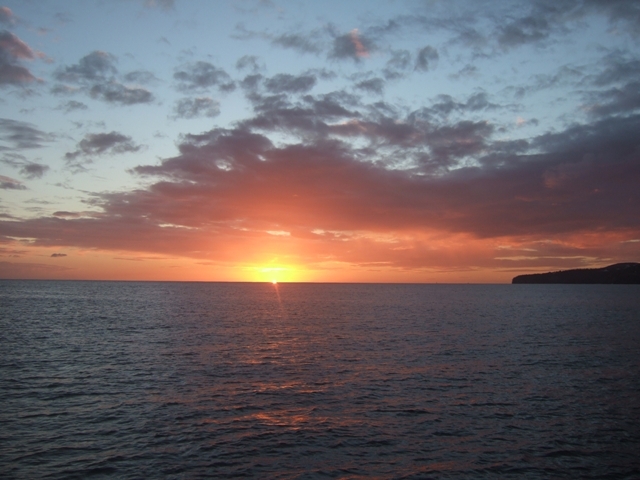 Above and below, sunset at Schoelcher, near Fort de France, where we anchored overnight. 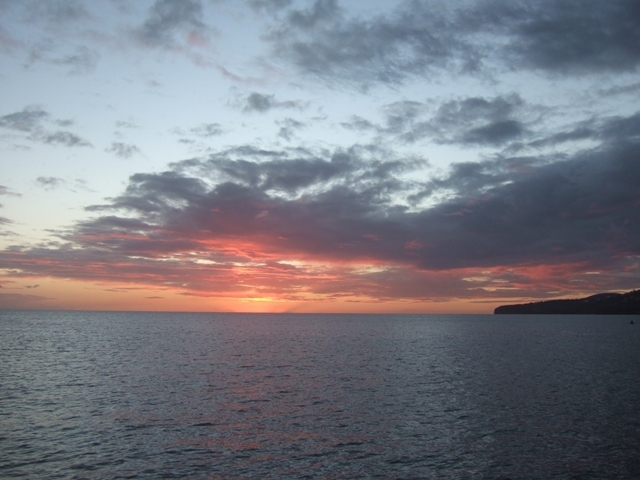 On the approach to Fort de France we went passed a small town called Schoelcher as the sun went down. Although there was very little in the pilot book about it, it looked well sheltered so a quick decision was made to try anchoring off it rather than enter Fort de France in the dark, especially as we would be heading south again in the morning to get to Le Marin on the south coast. Apart from a couple of moored boats we were the only ones there in what turned out to be a very peaceful bay with a flat sea and just a gentle swell. Heading south again the next day, the sail down the remaining part of the west coast was superb - a strong winds over a flat sea protected by the land. It wasn't so good though when we had to turn east along the south coast. The strong wind was now on the nose and we encountered big seas as we passed Diamond Rock, tacking the last 10 miles or so to get to Le Marin. When there we found that the charts and GPS were out by about 100 yards. 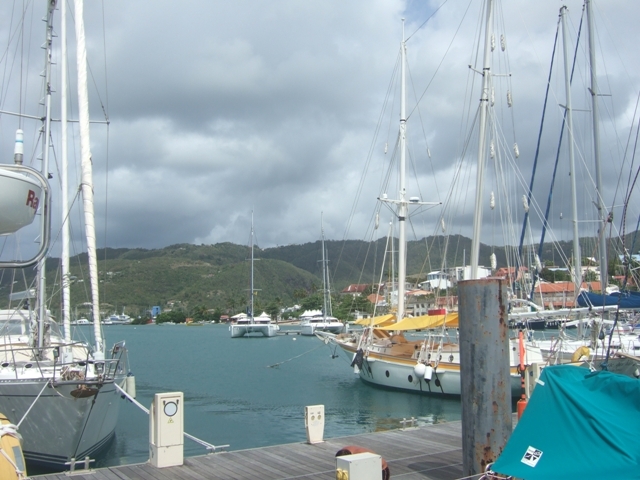 It's not the first time - when anchored in Antigua the GPS put us on land! 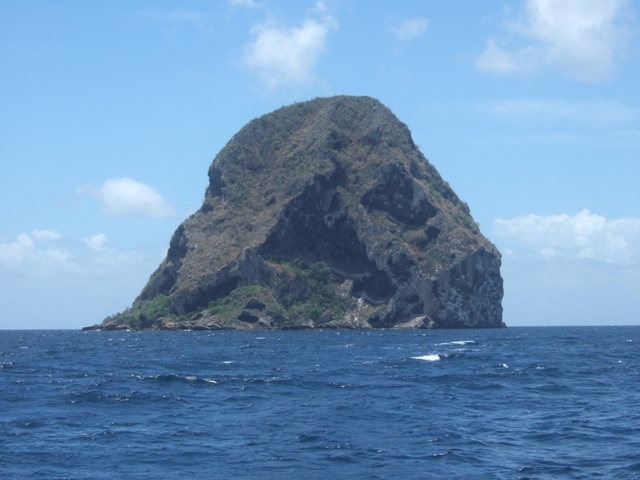 Diamond Rock, on the south west corner of Martinique. Diamond Rock is about a mile off the coast. When England was fighting the French back in Nelson's day, the English fleet in this part of the Caribbean was based in Rodney Bay St Lucia, about 25 miles to the south of Martinique and the French were based in Fort de France. The enterprising English declared Diamond Rock to be a ship and managed to put guns on it to take pot shots at the French every time they headed south from Fort de France. Above and below, views of the big marina at Marin. We'd never seen so many masts! Le Marin is the centre of the French yachting industry in this part of the world. 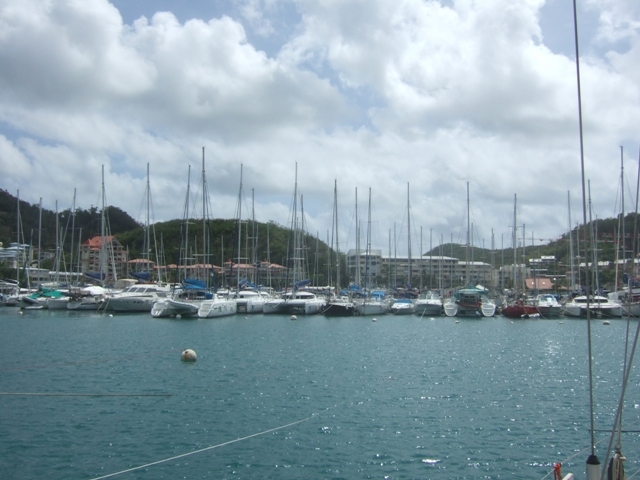 The marina is huge and the base for loads of charter companies, most of which are chartering catamarans, some very big. Boats are moored stern to (no finger pontoons) with bow lines out to buoys. Maneuvering into position with strong winds blowing is definitely a spectator sport - good when you're watching, not so good when everyone is watching you! We did it without a mishap, but the bow thruster has never worked harder and the marina staff did tie our bow line to the buoy, which helped. 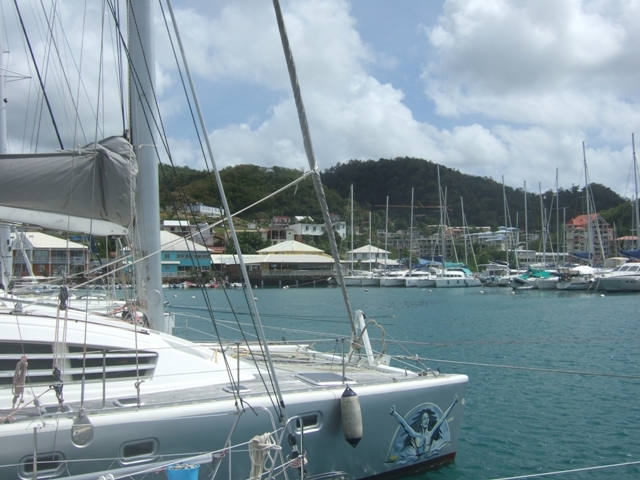 We stayed in the marina a few days to carry out maintenance work on the generator and then headed south to St Lucia to meet Janice and Clive, anchoring in Rodney Bay in front of their hotel.